The nation is today celebrating Armed Forces Flag Day.The day is observed every year on 7th December, since 1949 to honour soldiers, Sailors and Airmen of Indian armed forces.The need to constitute a fund for the welfare of the defence personnel was felt after a few years of India attaining independence. Hence, A commission was set up by the Ministry of Defence which decided tocelebrate 7th of December as the Flag Day. Hence, flag day is dedicated to commemorating the courage of our servicemen as also to collect funds from the citizens of India for helping in the rehabilitation of ex-serciemenand providing financial aid to widows and dependents fo martyrs. All armed forces of India – Indian Army, Indian Air Force and Indian Navy, arrange a variety of programs, shows, dance, carnivals, drama and other entertainments activities to showcase the efforts of their staff in ensuring the national security well as of the general public. Make your contribution towards the Flag Day fund. 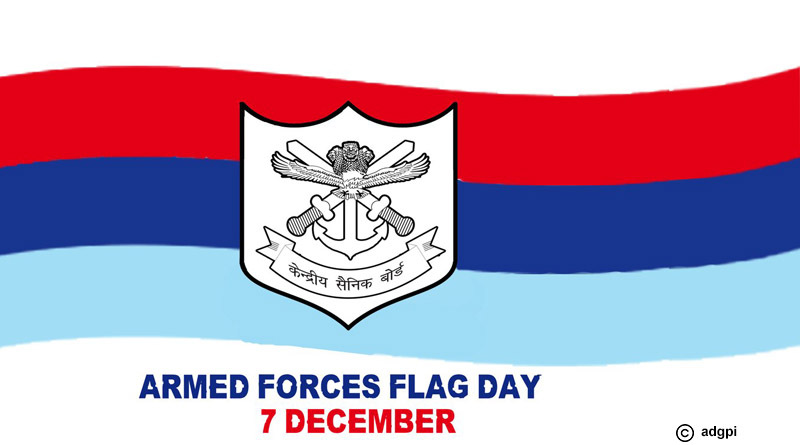 You can join in by wearing Armed Forces Flag from 1st to 7th December to pay respects to the brave soldiers of our nation. The flags are available at all Government offices. You can also contribute by donating to the fund by visiting http://ksb.gov.in where you can download the printable version of the flag pay online through net banking, debit or credit card to evenPaytm transfer to 8800462175.Contributions made to Armed Forces Flag Day Fund are exempted from Income Tax.